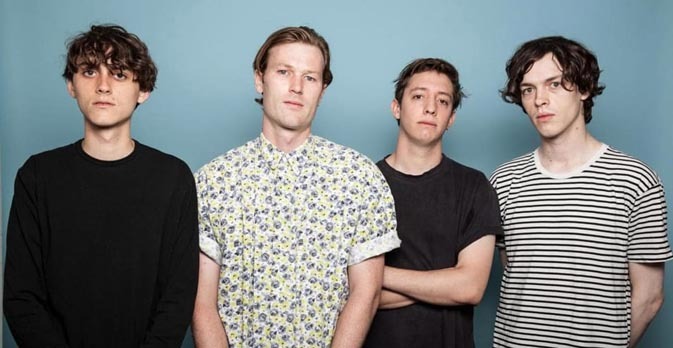 Gengahr's second album release gave us che opportunity to send a bunch of questions via email to Felix Bushe, the singer and the mail songwriter in the band. His answer show how natural was for the quartet to go towards the wider sound featured in this album in comparison to the debut. You said that your vision of what Gengahr have to be is different now compared to when you made the first album, and it’s clear comparing the two listenings. Is there a defining moment for this change of vision, or did it come spontaneously? I think the change was very natural. Life is too short to be repeating yourself so the ambition is always to make something new each time. For me the great artists are the ones who constantly seem to reinvent themselves yet manage to make it feel as natural as their last incarnation. That’s the underlying ambition within what we do as well. You also said that you recorded a version of the album that you ended up feeling uncomfortable with, but you were confident that, with the songs you had, you would have been able to record something you would have liked. What didn’t you like exactly, the sound itself, or the way it coped with the songwriting? Did you feel that the songwriting was not enhanced enough by the sound? I think fundamentally we ended up with something that just didn’t feel natural or human enough. We had a lot of time in the studio and we were so focused on making something perfect that we ended up suffocating the recordings a little. What we really learnt from the process is that the imperfections can often breathe life into a song and they should be embraced alongside everything else. Because of the importance of the songwriting phase in your work, at least for what you say, I ask you how does it work on Gengahr. Is there a main songwriter, or do you write collectively? Do you write music and lyrics separately or more or less together? I am very much the primary songwriter in the band. I have always written the songs but we collaborate a lot on the music. Ideas are often started by John, Hugh and Danny and then it is up to me to take that away and build a song around it. The process doesn't really have any rules and it tends to change song by song. I think that really helps keep the songwriting varied and unpredictable! I think the main difference between the two albums, both in terms of songwriting and sound, is that this new one is more straight and bold at the same time. The new songs have a general feeling of energy, positivity and self-confidence. Do you agree? I hope so! We certainly took a lot of confidence from our experiences of the first record. The audience's response the critical response and most of all the live shows. Playing to bigger crowds and feeling the love that they brought really allowed us to grow and feel more sure of what we are doing. Because both of the melodic and vocal style, I think I could sing all of these new songs, or at least the majority of them, in the shower or while I’m driving. Would you like that any listener would have this kind of thought? Haha of course! As a singer nothing makes me happier than hearing other people sing my songs. I love it, it’s a wonderful feeling. I have the feeling that you worked a lot on the tracklist, and you started with the cleanest song, continued with the ones whose sound is a little bit more dirty and filled with reverbs, and then with the more dreamy ones. Yeh i think that there is a general feeling in music now that albums are less important and that everyone just listens to the singles on spotify or adds their favourite tracks to playlists. Maybe we are purists but it still seems like a really important part of making an album. Figuring out the perfect way for the listener to journey through your music is definitely very important. What are your lyrics about? Was there a big change for them between the two albums as it happened with the other aspects we talked about? My intentions on this album were fairly simple. I wanted things to be more personal and i hoped that by opening up and revealing a little more of myself it would hopefully allow the listener to connect with the songs a little better. My favorite song of the album is “Pull Over (Now)”, would you tell me whatever you want about it? It’s one of my favourites as well. I think perhaps it is the track on the album that looks further beyond this album and to what we might be doing next. I think that’s why it excites me most. You are about to tour Europe, and you’re also coming to Italy, what should we expect from your live show? Will you maybe adapt the old songs to your current vision, or will you be faithful to their studio version? It’s always a fine balance when playing live. We try to keep enough of the studio recordings to keep things sounding warm and familiar but also we try to inject a little more energy and produce performances deserving of the crowd. Talking about live shows, I guess you’ll appear in some outdoor music festival this summer, after the extensive tour in clubs. Did you study something different for the two situations? They are always a little different yeh. Playing clubs is always fun, loud, sweaty you know what to expect. But outdoors can be a little trickier. I think we are quite luck with our sound though and it works just as well in either scenario. The album will be released also on cassette (which is now a thing again, and personally, I’m very happy about that), an there’s also the seed packet thing for the first orders. Are these your ideas or do they come from the label? No, these are ideas we wanted to pursue for the album. Being children of the 90’s we still remember tape and it played an important part of our early musically experiences. As far as the seeds go we are also big fans of nature and it seemed like a beautiful idea to help make the world a little greener!